Students wanting to enroll in or drop classes, check the status of their financial aid, or simply take a look at their schedule only need to log in to MineOnline, said Jill Robertson, Academic Advising peer adviser. Robertson said MineOnline is an online directory that allows students access to their account information. “A lot of people don’t know about [MineOnline] until they meet with an academic adviser,” she said. MineOnline offers a variety of options, including being able to add and drop classes, look at transcripts, check grades, look at financial statements or even pay tuition and fees, Robertson said. She said students who need help with MineOnline can stop by the Academic Advising office, located on the first floor of the Main Building across from Registration, and speak to a peer adviser who can instruct them on the basics. “Every new student that we see, we show them how to use MineOnline,” Robertson said. Once students have been admitted to OCCC, she said, they are able to immediately start using the services. Students may access MineOnline by visiting mineonline.occc.edu . 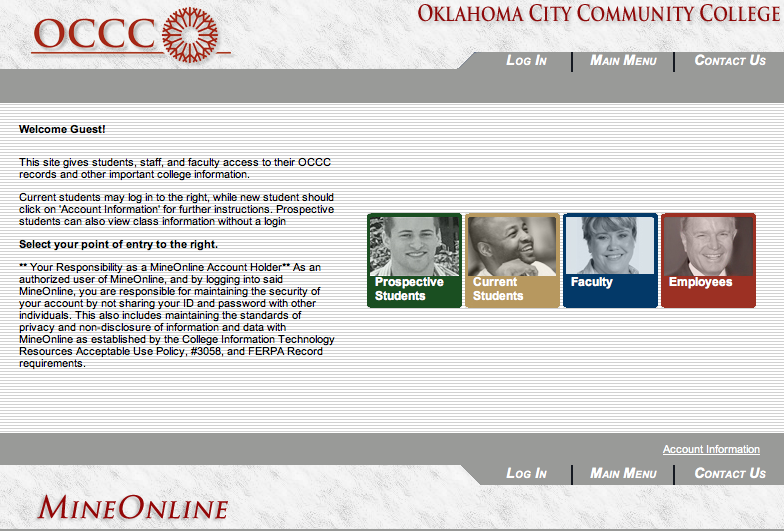 In addition, she said, the program is also linked on the college homepage at www.occc.edu . Robertson said students will then select “current students” and log in using their first name, followed by a period, their middle initial followed by a period, and last name. The password is the last six digits of their social security number, she said. Once students are able to log in, Robertson said, they have an option to change their password by altering the preferences in their student e-mail. After logging in, students will be presented with a menu of options, including academic profiles and class registration. She said MineOnline is a great tool for accessing class schedules and transcripts. If a student needs help with MineOnline, she said, students can either stop by or call the Academic Advising office during business hours, which are 8 a.m. to 8 p.m. Mondays, 8 a.m. to 6 p.m. Tuesdays and Wednesdays, 11:30 a.m. to 6 p.m. Thursdays, and 8 a.m. to 5 p.m. Fridays. For more information, contact the Academic Advising office at 405-682-7535 or visit www.occc.edu/ACS . To contact Whitney Knight, e-mail onlineeditor@occc.edu.